The recipes that one of New York’s best young chefs cooks in his own kitchen: a cookbook full of soulful, sophisticated food and delicious storiesWhile waiting for construction to finish on his restaurant A Voce, Andrew Carmellini faced an unusual challenge. After a brilliant career in professional kitchens (including a six-year tour as chef de cuisine at Café Boulud), he was faced with the harsh reality of life as a civilian cook: no prep cooks, no saucier, no daily deliveries—just him and his wife in their tiny Manhattan-apartment kitchen.Urban Italian is made up of the recipes that result when a great chef has to use the same resources as the rest of us. In these hundred recipes—covering four distinct courses, side dishes, and base recipes—Carmellini shows how to make stunning, soulful food with nothing more than the ingredients, techniques, and time available to the ordinary home cook. 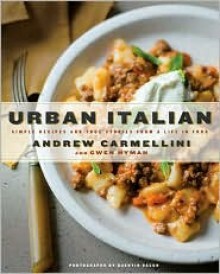 The food is sophisticated but also easy to make: lamb meatballs stuffed with goat cheese; veal, beef, and pork ravioli; roast pork with Italian plums and grappa; fennel with Sambuca and orange; and a honey-flavored pine nut cake.The book opens with a narrative (written by Carmellini with his wife and coauthor, Gwen Hyman) that traces Carmellini’s culinary education—a series of outrageous tales that will delight anyone who loved Heat or Kitchen Confidential. Also scattered through the book are short pieces on places and ingredients, placed alongside recipes to shed light on the history and practice of simple, beautiful cooking. This is a book you’ll find yourself using all the time—to cook from for weeknights and for special occasions, or just to sit down with and read.